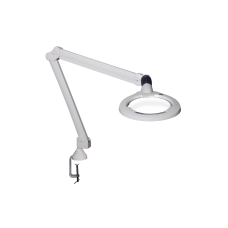 Circus LED is specifically designed to withstand the rigors of everyday use in cosmetology, industrial, manufacturing and cleanroom applications. Circus LED has a large lens, aluminum head and a highly flexible self-balancing arm and shade neck. The large lens also permits comfortable viewing for individuals with impaired vision.